Valve is making some big changes to Steam in the coming months with the addition of new features like Steam Events and a redesigned look for your game library. At the 2019 Game Developers Conference on Thursday, Valve’s Alden Kroll revealed a new, information-dense design for Steam libraries that will emphasize recently played and recently updated games. Each user’s Steam library will now have its own homepage. 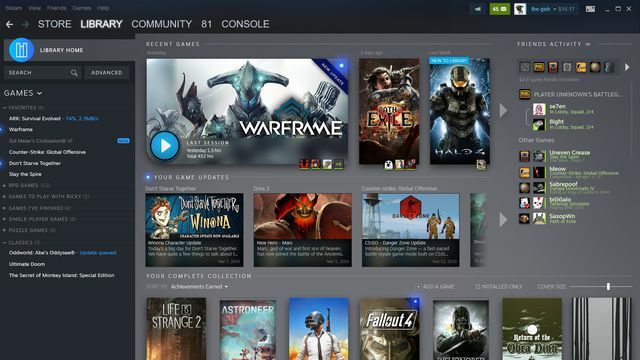 Kroll showed an example page that displayed a user’s most recently played games at the top of that homepage, with the intention that a Steam user would be able to easily jump into one of their most played games. The redesign also made it clearer which Steam games a user’s friends were playing at the time, and which games had recently been updated. Game updates — things like new characters or game modes — will be highlighted as well. Just below the section of the Steam library page that listed recently played games was a section titled “Your game updates.” As examples, Valve showed a new character update for Don’t Starve Together, a new hero for Dota 2, and the new Danger Zone game mode for Counter-Strike: Global Offensive. The rest of the redesigned Steam library page listed friends activity and a user’s complete collection of games, with filters to help sort and display them. Individual game pages are also getting a visual overhaul. 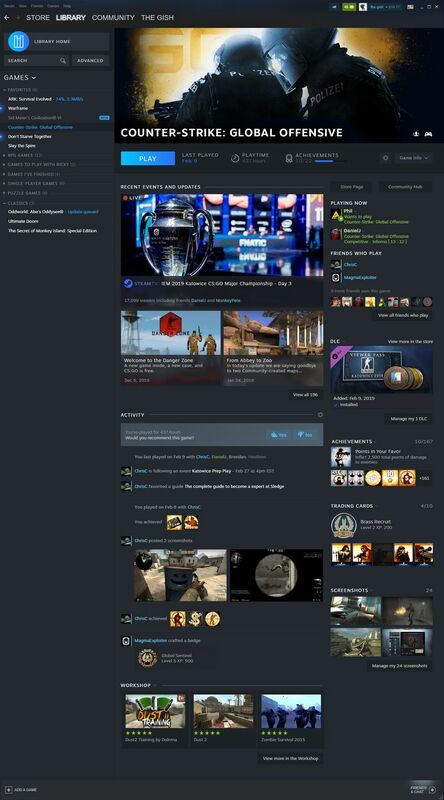 An example page for CS:GO elevated information like recent events and updates, friend activity, and available downloadable content for the game. Valve’s redesign of the Steam library is coming in beta form sometime this summer. Prior to that, Valve plans to release a new feature called Steam Events. Kroll said Valve is adding Steam Events so that developers will be able to communicate to customers “when there’s something interesting happening in a game.” Examples of Steam Events include in-game events tied to holidays, developer livestreams, bonus weekends that offer double XP, and tournaments. Events will be shown throughout Steam, Kroll said, including current events that players can join now and future events that they can receive reminders for. Players will be able to opt in to reminders for upcoming events via external calendars (iCal, Google Calendar, etc. ), email, mobile app notifications, text messages, and Steam itself. Steam Events will enter open beta in the coming months. 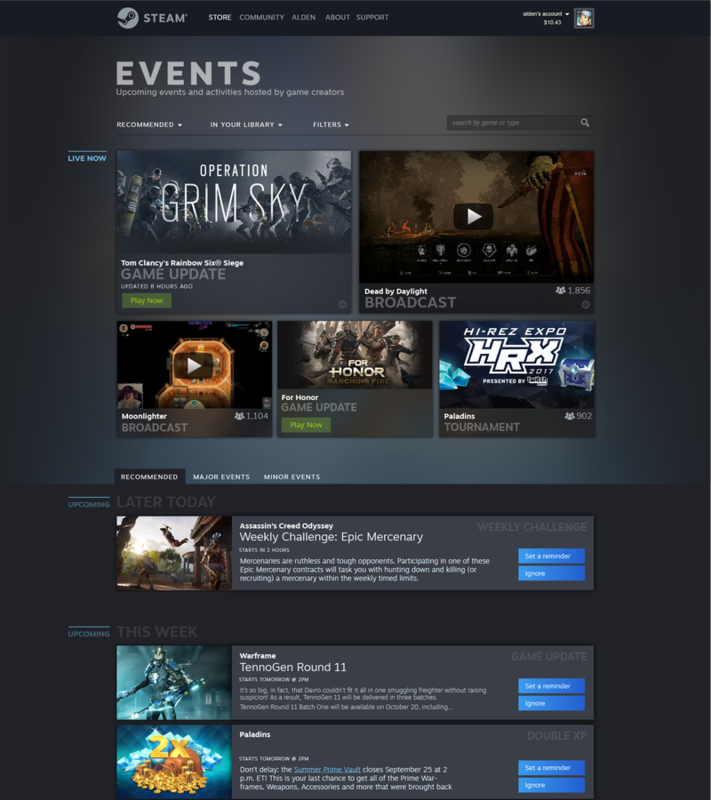 Check out the gallery below for a look at more mockups of Steam Events and Steam’s updated game and library pages.